Being in the great outdoors can be a fun and immensely rewarding experience. Any avid outdoor enthusiast knows just how quickly weather can change when spending time in mother nature, that’s why it is always best to be prepared with the best hiking hat. When in extreme heat, a hat is your best line of defence against sun stroke and nasty sun burns. Most of your heat is lost through your head, and that’s why when facing cold and wet weather conditions, a hat is the last line of defense against hypothermic conditions. A great hiking hat can provide every means of protection you’re looking for. There are many factors you should consider when purchasing a hiking hat. Each one of these creates a hat that will provide protection for any outing. The sun emits ultraviolet rays which can cause burns on the skin and degrade vision over time. Humans are not capable of seeing these rays but their effects can be severe. Much like sunglasses, hats can come with UV protection. People with thin hair, or sensitive scalps, should look for hats with this feature when deciding on a hat. These special hats are rated by an Ultraviolet Protection Factor (UPF), where the higher number is, the better it will protect you. A UPF 50 rating allows approximately 2% of the UV rays to touch your skin and is the highest protection currently on the market. Your skin can indicate the amount of protection you need. If you regularly spend time in the sun, or have a darker complexion, you can handle a lower amount of UV protection. People with fair skin who regularly fall victim to sunburns should look for a hat with a UPF 50 rating. It may be counterintuitive, but wearing long-sleeved clothing, including a hat with neck protection, can go a long way to help protect you from harmful UV rays. This can give you the proper sun protection while letting air pockets cool you down. There are certain factors that will reduce the effectiveness of this protection. It is not often thought of but stretching a smaller hat onto your head can let up to 40% more harmful rays through the material which will harm your skin. Make sure you get a hat that fits properly so that this doesn’t happen. Keeping the hat dry can also maintain the rated protection. A wet hat can reduce the effectiveness by up to 50%. Running the hat through the laundry has been shown to have little effect of the clothing. A clean hat will also maintain the designated rating so you won’t have to replace it anytime soon. When deciding on the best hat for you it is important to consider how you intend to use it. If you plan to use the hat for extended hikes, it is crucial you find something that will be comfortable to wear for long hot days. If you are using the hat in summertime, getting a hat with bug and UV protection will prove beneficial, whereas if you are going rock climbing having a hat that will be secured on your head is important. You also want a hat that will breathe and wick away moisture when you start to get too hot. Also, make sure the hat is lightweight. A heavy hat will weigh you down and possibly create strain on your neck. Sizing is also important, as a hat that’s too tight can lead to headaches, putting a damper on your trip. You don’t want your hat to be too loose either, as even a small breeze can whip your hat right off your head. This is the determining factor about the style of hat you should look for. Check the weather ahead of time so that you can pack accordingly. Depending on the weather it may be a good idea to have more than one style of hat. For example, if you are hiking in the summer, a baseball cap might be good during the day, and a hat with a neck protector would allow for a mosquito repellant for the evening. Additionally, colder weather can cause you to need warmer material and neck protection. Hats can be made out of different material. Some companies have their own proprietary fabric that has been specially designed for different occasions. Keep in mind certain material will act differently on the trail. For example, cotton should be avoided as it absorbs water, such as sweat, which makes it a bad choice for hiking. Lightweight polyester material: a good fabric choice as it wicks your perspiration away from your skin. Staying dry is very important on long hikes and this material will ensure you do just that. Being lightweight ensures the hat will fit without weighing you down and causing you unnecessary strain. Mesh: another important material when it comes to hats. Being able to breath properly cannot be stressed enough. Having mesh sides or along the crown will ensure your head will not overheat. This is also a very lightweight material that is good for dry climates. Since this material is very porous it is not recommended to be used in rain as it will not protect your head from the elements. When looking at the hat make sure the stitching is high quality. 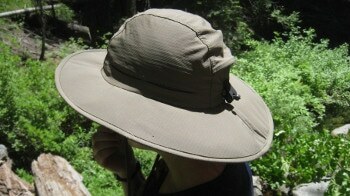 Hiking hats should have stitching that creates a durable bond between the material. Being able to easily store a hat in your backpack repeatedly is crucial for a long hike. You need to be able to adapt to the weather and being able to store your hat without worrying about wrecking it is important. Hiking means you’ll be traveling in areas where there are bugs and insects roaming around, and many of them are not too friendly. Mosquitoes and ticks are a large concern, as they carry blood-born diseases that can be transmitted very easily if you’re not careful, such as Lyme disease and malaria. Having a hiking hat that provides protection against these biting insects is definitely worth the investment if it saves you from a trip to the hospital later. You are one of a kind and you want a hat to compliment your unique personality. Hiking hats come in different styles. These can range from a simple baseball cap to a circular brimmed sun hat. Baseball cap: If you have done your research and don’t anticipate any inclement weather on your hike a standard baseball cap could serve your purpose. This will keep the sun out of your eyes and keep you nose from burning in the sun. If you are hiking in hotter climates, or will be in the sun for prolonged time, a hat that protects your neck is recommended. Baseball caps are lightweight and easy to store. They can be strapped to your backpack for easy storage. Sun hat: If you want a hat with more protection from the elements a sun hat might be a better choice. There are a couple different styles but will always include a large brim or some sort of neck protection. When looking for a high quality sun hat make sure it includes a drawcord. This will ensure the hat stays on your head when it is windy. Snaps that can raise the brim around your ears can create a completely different hat. This can create a hat that allows rain to drain and vent your ears in extreme weather. These hats are very versatile and can be used during a wide variety of weather. Features: Machine washable, moisture wicking, fast drying, available in nine colours, under visor reduces glare, ponytail opening. Made with high wicking material that even includes a sweatband this hat is designed for running and high activity outings. The adjustable clasp of the Headsweats Performance Sports Hat is a perfect measure to keep this hat on your head no matter the weather or sport. Being machine washable coupled with ultra quick drying material ensures it will always stay clean and be ready for anything you throw at it. This hat provides an excellent amount of shade to fully protect your face even on the hottest of days. Features: Lightweight, drawstring chinstrap with toggle lock, KAVU adjustment, quick-dry Teslan, poly mesh headpiece. While the KAVU Men’s Chillba Hat may not be the most stylish of hats, it is certainly one of the best functioning. Covering a large surface area this hand washable hat is made of Nylon. With a quick dry Poly-Mesh headpiece, this hat is sure to keep you protected no matter the weather. It even has been found to cause rainwater to bead off of it not penetrating the hat. The Niuniu bluecell hat is a good choice for any hiking trip. This is a sun hat with an impressive five inch sun brim. The vent holes allow your head to breath easily. A chin strap keeps this hat securely on your head while two buttons lift the brim exposing your ears making a completely different hat. Don’t worry about the weather as this hat is sure to keep you dry. It is made of a quick drying material so even when wet it won’t take long to be ready for your next adventure. This hat is great for men and women alike and is sure to keep you protected. We love this safari looking nylon-polyester blend hat. Its quality construction gives it a solid UPF 50+ sun protection rating – the highest possible. Perfect for a sunny day, this hat contains breathable cooling vents and a mesh lining for optimal moisture control. This durable hat has large foam stiffened floats providing a good amount of shade to the face. An excellent choice for any avid hiker or outdoors person. This hat will float if dropped in water, a feature that can come in handy when out fishing on the lake. The brim of Outdoor Research Sombriolet Sun Hat is flexible and can be contoured to block the sun no matter where it is. The drawcord is removable and creates a hat that can be worn for any occasion. Coming in a variety of neutral colors, get one for the whole family and watch as it works no matter where your next adventure takes you. This hat is made of a durable blend of nylon and polyester which ensures it will stand the test of time. Coming in a variety of neutral colors, get one for the whole family and watch as it works no matter where your next adventure takes you. This may look like an average baseball cap, but it definitely is not. Two snaps on the front allow this cap to be transformed into an exceptionally effective neck protector. The included sun skirt covers all of your neck and can be adjusted with a drawcord. The material of the Outdoor Research Sun Runner Cap features a UPF 30+ rating that will give you better protection from the sun extending over your entire head and neck. This can also function as a wind and rain proofing measure providing more protection for your face. When in use the sun skirt protects the neck from mosquitoes and other insects as well. Mesh sides allow the head to breath freely when used in the baseball cap mode. Coming in a variety of colors, this cap is sure to show your style and act as a fashion accessory. This cap is incredibly functional as an all in one hat that can transform from the desert to the rainforest. Features: Reflective logo, snapback, mesh ventilation, available in ten colours, moisture wicking fabric, adjustable fit. This baseball style cap is stylish while being high quality. Made by a trusted brand, the hat boasts a special blend of polyester and elastane material, creating a hat that is comfortable and functional. This combination makes the hat exceptionally lightweight and able to wick moisture away. The reflective Under Armour logo on the front of the hat will ensure you are seen during night activities. A velcro closure ensures allows this hat to conform tightly to just about anyone, no matter the size of your head. Coming in a variety of different colors you are sure to find one that fits your unique style and makes you stand out from the crowd. With side vents this is the perfect summer hat for your next adventure. Features: Drawcord, large brim, one size fits all, moisture wicking, extremely durable, available in two colours. This is a very well made sun hat. The lightweight military design incorporates a round hat, durable chin strap and large brim. This hat provides lots of shade and is designed to be lightweight and keep your temperature low in the summer. The integrated sweatband wicks moisture away allowing you to see clearly. This Under Armour hat includes a large drawcord that will keep it on your head even in the toughest wind storm. Equipped with a flatlock seam, this durable hat is sure to create comfort without chafing. The one size fits all hat expands to fit snugly to your head. Sure to turn heads this thin hat is the perfect summer accessory. Whether you are hiking, fishing or even simply gardening, a hat is a great way to protect yourself in any weather. In the hot sun it acts as a strong line of defense against heat stroke providing much needed shade for your face as well as uv protection for your head. In less kind conditions such as wind and rain a hat can provide some shelter for your face and allow water to bead off of your head keeping you warm and dry. No matter the weather carrying a lightweight hat in your bag is always a wise decision. Finding a hat that is durable and functional will prove incredibly beneficial. Tried one on our list or have a different favorite hiking hat? Let us know what you think in the comment section below.